Outdoor Retailer is so big sometimes I wonder why it’s not in Vegas. But no, Salt Lake City is the perfect setting for this fun, extravagant and energetic national tradeshow. With mountains only a short drive away, SLC is positioned perfectly to host this confab of outdoor enthusiasts from all over the country (and around the world). There’s so much going on in the outdoor industry that they hold the show twice a year: once in winter and once in summer. The recent OR Summer Market took place the week of August 4th at the Salt Palace Convention Center. On Tuesday, attendees were invited to an Open Air Demo at Huntsville, Utah’s Pineview Reservoir, tucked neatly in the Uinta-Wasatch-Cache National Forest just down the road from Snowbasin Ski Resort. 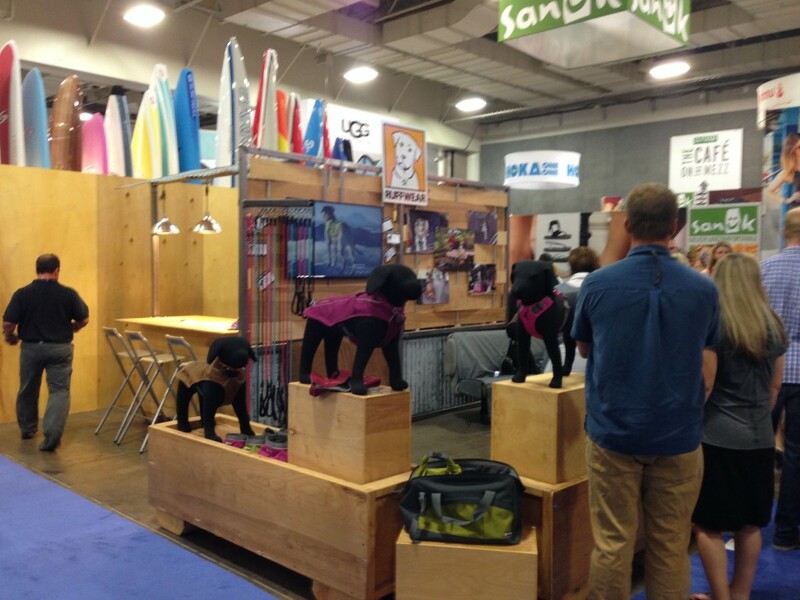 The OAD was packed with 100-plus small exhibitors crouched under branded canopies, many of them offering free tryouts on kayaks, paddleboards and more. After a brief downpour mid-morning, the rest of the day turned into a fun, engaging and playful event. As for the tradeshow itself, several acres of floor space at the convention center are occupied by the biggest show of the year in Salt Lake City, resplendent with top-notch exhibits, some as large as 100’ x 70’ that dominate the area. 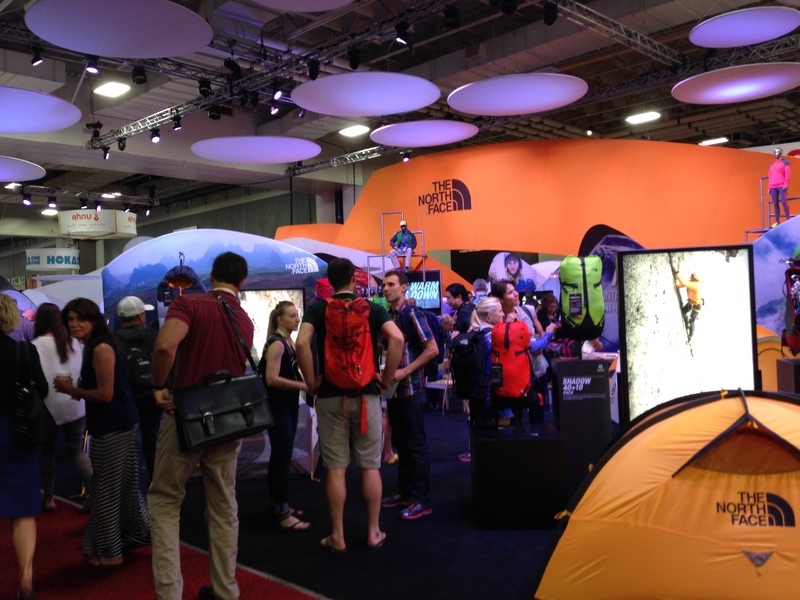 Keen, Merrell, Thule, Timberland, The North Face, Cascade Designs, Mountain Hardwear, Columbia and more came to Outdoor Retailer ready to show off their new goods – and no doubt spent a pretty penny with HUGE exhibits. So what caught attendee’s eyes? For me, it was solar power. Lots of solar chargers: foldable, portable and powerful. Solar power is coming into it’s own and in the next half a decade or so it should explode as the cost of creating a kilowatt of power via solar will continue to plunge below that of the cost of typical energy. It seems that every time I turned a corner there was another solar-powered gizmo. And the booths? Well, let’s have a little fun with some awards, shall we? Best brand representation: Keen Shoes. 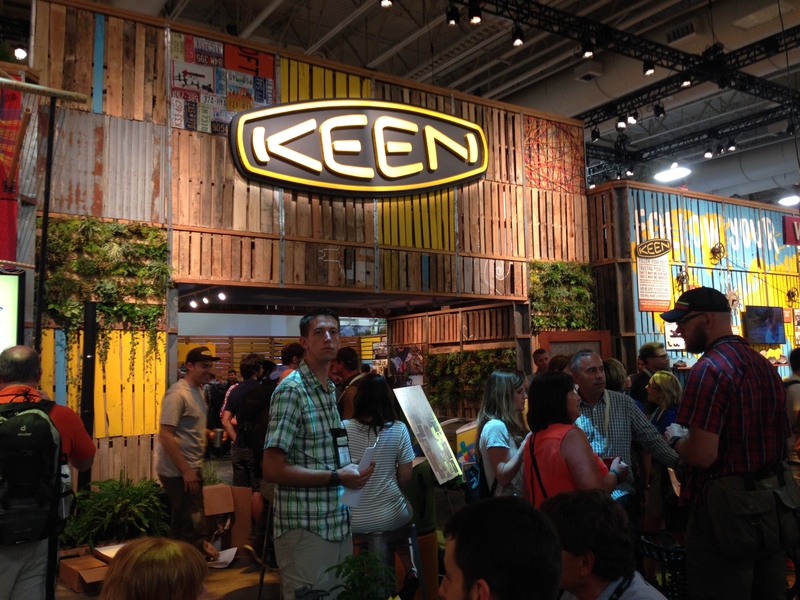 Yes, this is a category with a lot of tough competition, but Keen is so over-the-top with recycled pallets for walls, recycled windows, hand-made booth elements and funky swagger that how can you NOT give this award to Keen? Walking Dead Re-birth: Kelty. 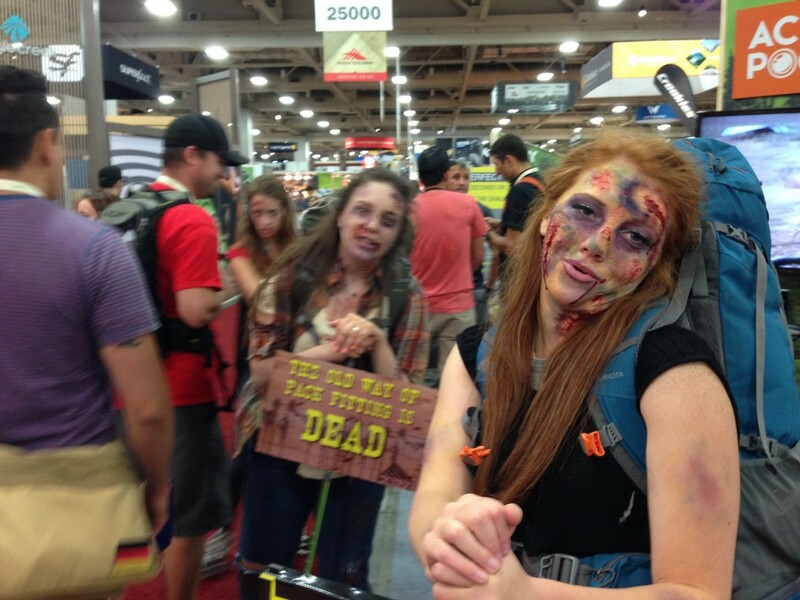 Yes, the Walking Dead were used as inspiration for having to carry around a crappy backpack, so you’d better get fit with a really good Kelty Pack! Best Use of Stuffed Dogs to Show Off Your Products: Ruffwear. You might be surprised, but there were a LOT of stuffed dogs used to show off gear. Ruffwear managed to do it with style with gear made exclusively for dogs. Talk about focus! Best Tent Campground. Lots of tents at OR, but The North Face took over nearly a quarter of an acre with tents. Lots of tents. It felt vaguely like a Grateful Dead concert, missing just the tie-dye and herb. 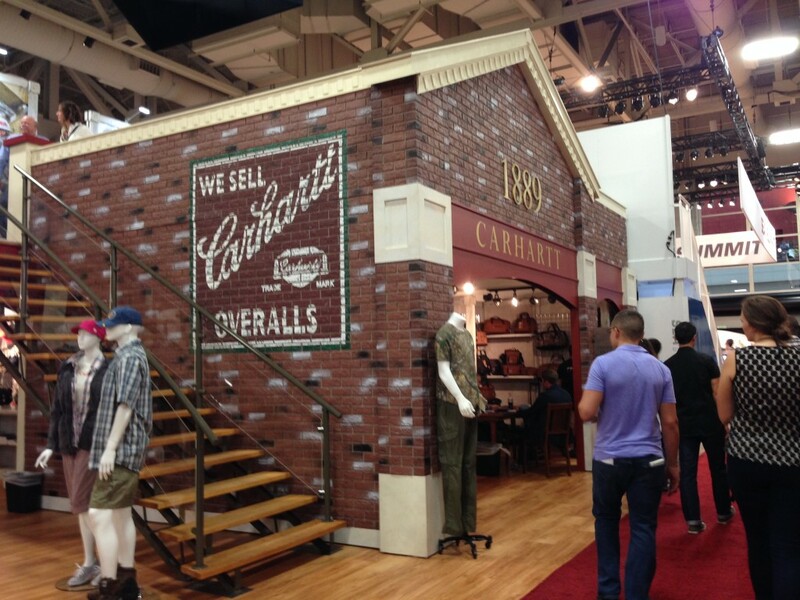 Best use of Brick: Carhartt. The faux brick surface made it look like the two-story booth that represented a storefront had been built one brick at a time. Beautiful. 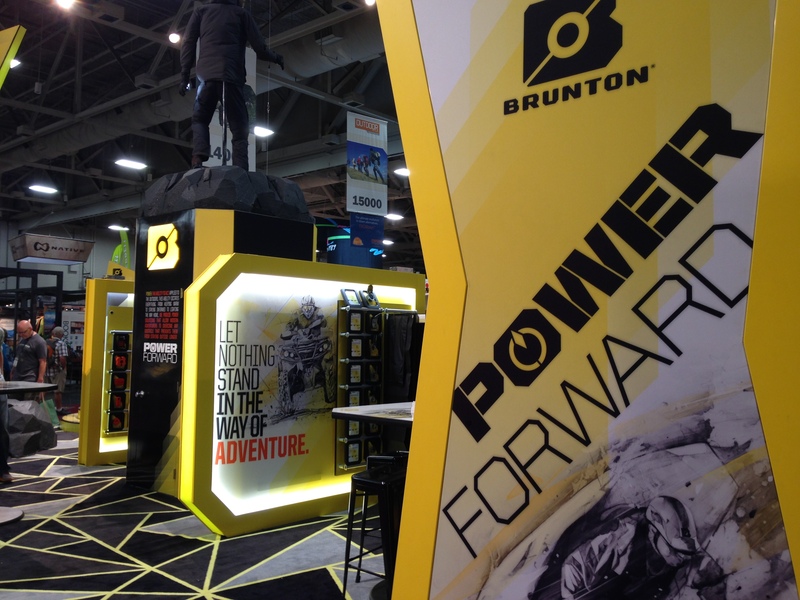 Best ‘Stop Dead in Your Tracks’ Booth: Brunton. Use of bright colors, back lit panels and shapes that grab your attention did indeed stop people in their tracks. Hard to capture in a photo, but I gave it a try. Best Product Demo Video: Coast Portland. It took a little patience, but after viewing the video shot near Oregon’s Coos Bay showing off the company’s flashlights, you came away convinced that they were the best you could buy. 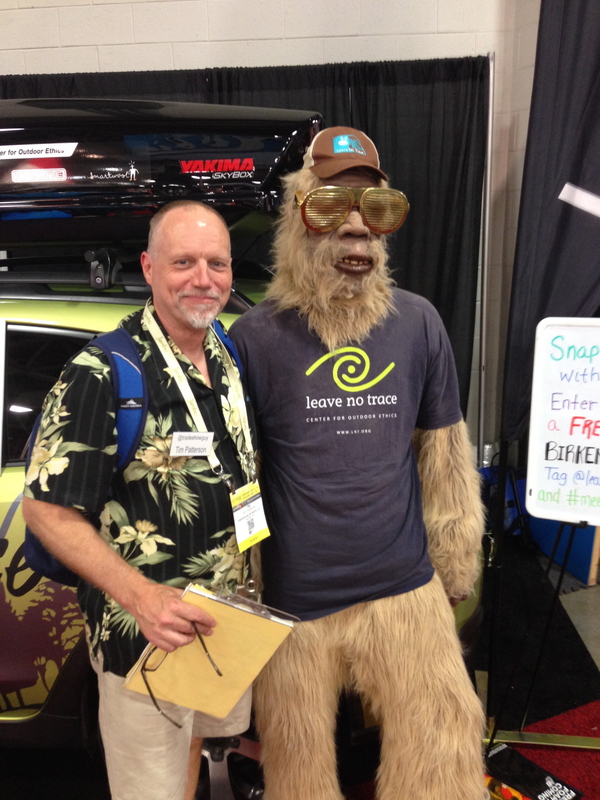 And finally, Most Iconic Use of an Icon: Leave No Trace’s Bigfoot, who posed for photos and invited attendees to tweet selfies for a chance to win footwear! I spent two days of the show jotting notes on my clipboard, doing booth assessments: subjecting almost two dozen booths to a closer exam that I call the Tradeshow Booth Performance Test. I’ll be sharing that information with those companies in the few weeks – always a great learning experience for both (I hope!). 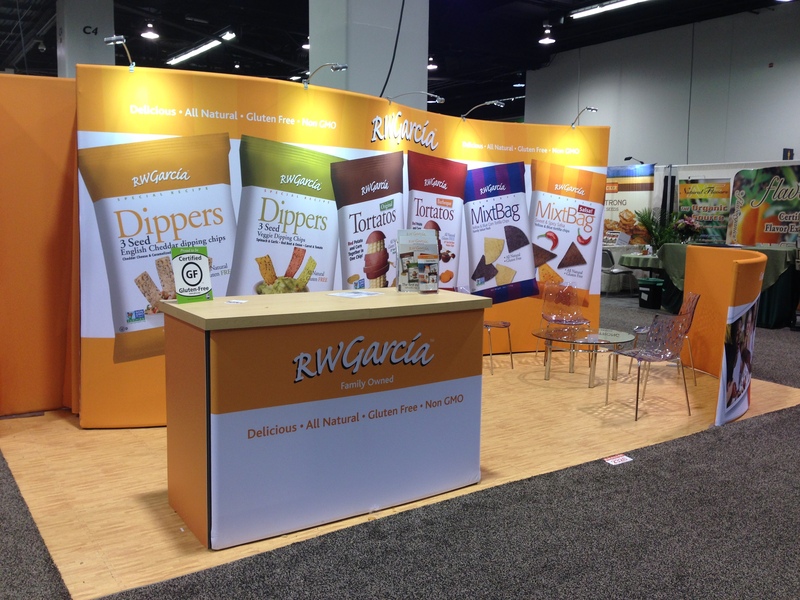 Just returned from Expo West in Anaheim where I had a number of tradeshow booth clients, including Bob’s Red Mill, gDiapers, Aisle7 and Hyland’s. One of my goals at this particular show was to do informal assessments of a couple of dozen booths, including booths that I picked at random, and those of companies that responded to my 2-minute video I posted about ten days before the show. Since I have a handful of client booths at the show, I am disqualifying them from winning any awards (although I think they all were top-noth projects)! Before getting to the awards, a few comments: first, these are for fun only. Nobody actually wins anything substantial except a mention in this blog. Second, while I spotted a number of booths that would qualify for awards such as ‘Most Cluttered,’ ‘Most Confusing’ and ‘Shouldn’t Even Be Here Because Mom Didn’t Approve it’ the point is not to speak ill of booths that should be improved. Hey, I can’t help everybody, right? Cleanest Look & Most Pristine Representation of a Brand: R .W. Garcia. Not a custom booth, but an aluminum frame-and-fabric construction, nonetheless this captured my attention with its attention to detail. The graphical heirarchy was clean: company name at the top with secondary bullet points describing the company’s products. The back wall graphic was dominated by images of chip bags, so there was no doubt about the company’s products. Most Iconic Use of an Icon: Guayaki Brand Yerba Mate. 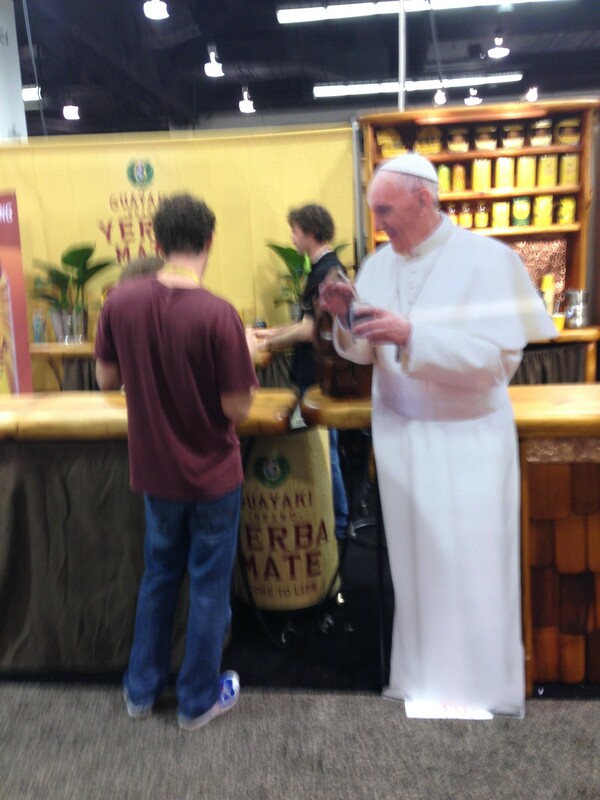 Okay, I only caught one photo of this, but the use of a life-size cutout of the Pope drinking tea stopped me in my tracks and made me want to have Yerba Mate with His Holiness. Best Story on a Booth: Amy’s Kitchen debuted their new booth in 2013, and this 30×30 island clearly captures the company’s natural image, including a back wall section with photos and captions detailing the company’s history. 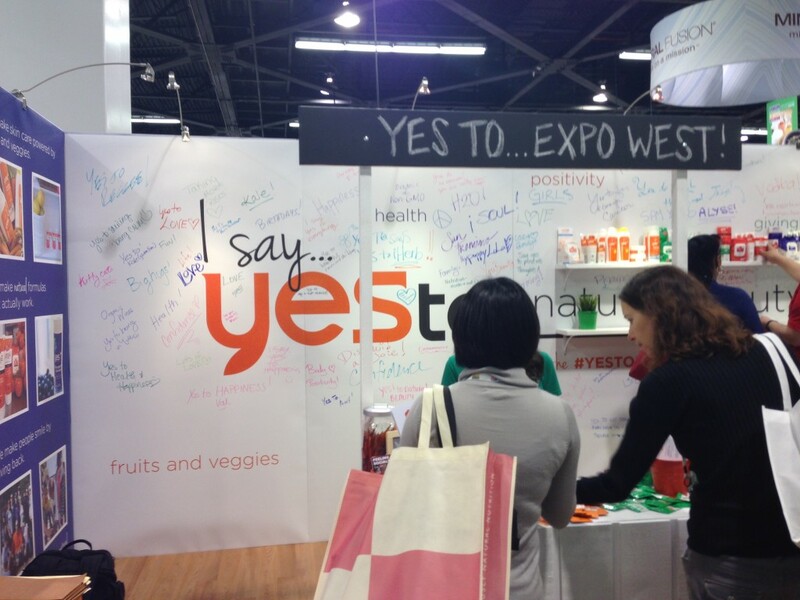 Best Interactive Booth: While there were several booths that invited attendees to write notes on a board, YesTo asked people to write what they would say YES to. Best Use of Shipping Crates: Several booths use shipping crates as part of their booth to save on time and shipping expense. 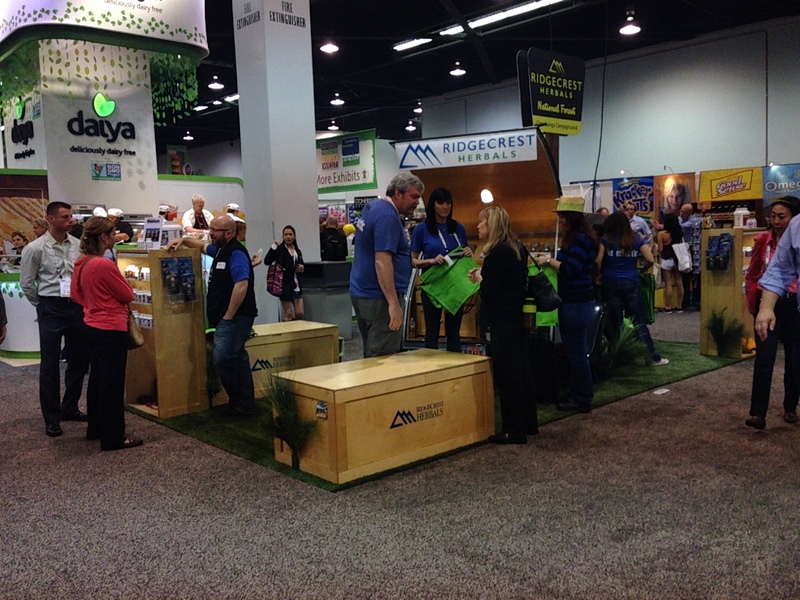 Ridgecrest Herbals showed how its done with branded shipping crates that doubled as counters, benches and product display. Best Dancing Mascot: SweetLeaf, with their Sweet Drops Sweetener doing his/her shaking to a live guitarist. Most Elaborate Use of Booth: Clif Bar. The 40×40 island that Clif Bar used to represent their brand included not one, but two enclosed client meeting rooms, two sample stations, messaging that showed their love of fun and helping Mother Earth and the creative use of repurposing old wood for something new. And more. Hanging plants in wooden boxes. Bicycle gears. Old window frames. The steep usage of the word ‘organic.’ With all of this disparate yet congruent elements, this booth came close to a Terry Gilliam dream (go ahead, look him up. I’ll wait.). And finally, Best MashUp of a Beatles Album Cover: Love Birch. With their wacky replacement of John, Paul, George and Ringo’s heads with leaves, Love Birch took the iconic Abbey Road album cover and turned it on its head, and in the process stopped people in their tracks. This is the 13th consecutive year that I’ve attended Expo West, and it still seems fresh and fun, bigger and bolder and more overwhelming every year. A few final observations: while there was a lot of use of social media this year, it didn’t seem to be anything out of the norm for most companies. Several companies invited attendees to ‘like’ them on Facebook, or tweet out a photo for a prize, but not as many as you might think would. I was also on the lookout for QR Codes, and was a bit surprised to find only one on display. I had tasked myself with testing each and every QR Code I ran across to see if it worked. This one didn’t. The invitation next to the code was to ‘like’ us on Facebook, yet when I scanned the code, I was taken to a home page of a website – not optimized for a smartphone – and there was no indication of how to get to Facebook from there. With QR Codes seemingly fading from popularity at least at this year’s show, perhaps that’s a good thing since it seems that so many QR Codes fail at least one part of the test: tell people what they get when they scan, make sure its optimized for a smartphone, and then test it all to make sure it works. iPads and tablets are pretty cool. The concept of having a hand-held tablet with amazing computer power has apparently taken over the world (thanks, Apple!) and launched a dizzying array of imitators and competitors. In spite of the competition, the iPad remains the most popular tablet, especially among tradeshow exhibitors. In fact, several companies are now vying for your business by designing and creating iPad stands or kiosks which present the iPad to your visitors so they can interact. But exactly what all can you do with that iPad in a kiosk? If you have a problem getting information to people in a timely way at a tradeshow, an iPad stand might be the answer. If you have a need to engage people in an entertaining way, an iPad kiosk might be the solution. If you have a goal in mind that fits with one of the following ideas, an iPad kiosk may be the ticket! While this is certainly not intended to be the complete list, use it as a thought-starter. Perhaps you can come up with other ideas on how that iPad kiosk can be used. Product Demos: a visitor stops and with a few touches, is seeing how others use your product and how they might envision how it would work for them. Photograph album: people love photographs, right? Of course: just look at the success of photo-sharing apps and sites such as Flickr or Instagram. With beautiful photos, you can show how other customers use your product or engage in your service. Depending on what your product is, those photographs can show details they might otherwise see, or the inside story of how it’s made. Lots of possibilities here. Sign up for newsletters: want to capture a visitor’s email or other contact information? Set up a sign-up sheet for your regular newsletter (you do have a newsletter, don’t you?). Send information without having to print something: face it, a tradeshow can be burdensome if you’re collecting sell sheets or printed product information. But you can encourage people to sign up for free PDF’s that can be sent via email, thus avoiding having to carry home a piece of paper. Eco-friendly – and it ends up in their email inbox instead of the round file. Games: does your product or service lend itself to a short interactive game? You might consider having an app designer put something together that lets visitors learn about your stuff in a fun and engaging way by creating a game around it. Product design: many items, such as clothing or house paint, lend themselves to an interactive experience where the user can compare one color with another to see how they like it. Survey: want to do some market research? Setting up a short survey on an iPad kiosk allows folks to chime in on those questions which keep you up at night. You can keep it anonymous, or offer a small prize in exchange for their name and email address. Quiz: perhaps your product can be positioned in such a way that a brief quiz is engaging. Come up with a handful of multiple choice questions or trivia questions to engage people. These are just a few of the ways in which an iPad kiosk might help to engage visitors at your booth. Can you come up with anymore? In the meantime, here’s a quick video from our iPad Kiosk supplier, Classic Exhibits, that shows how you might set up your own iPad kiosk. Remember, if this can solve a problem or satisfy a need, if will be a worthy investment. 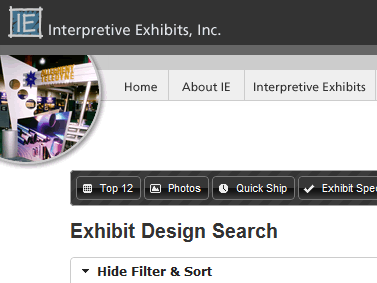 Check out the pricing at our Exhibit Design Search right now on iPad and Surface kiosks. It was my 11th year at Expo West as a representative of a company that provides exhibit booths for exhibitors. First: 11 years? Kidding, right? No. The first booth client I had way back in 2003 was Kettle Foods of Salem, Oregon, which lead to doing a booth for Nancy’s Yogurt / Springfield Dairy, Natracare, Hyland’s Homeopathic, gDiapers and many others. 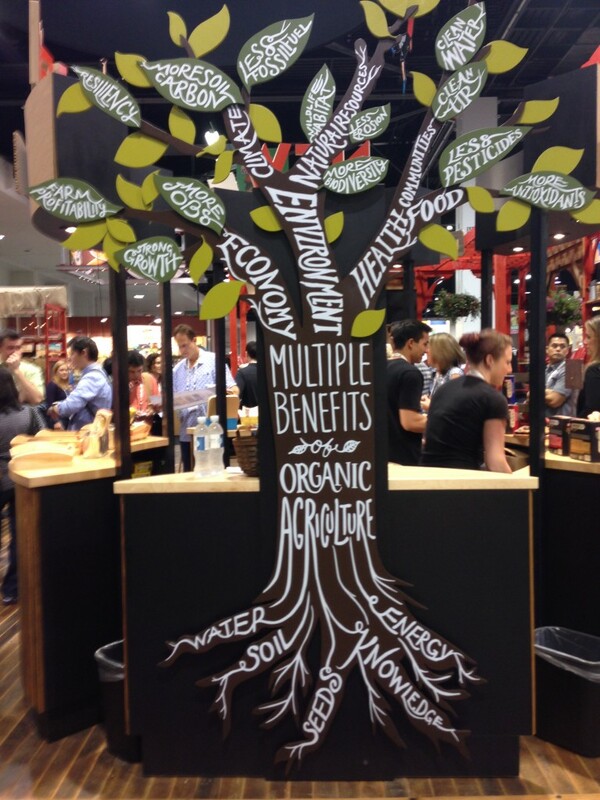 Besides having to basically eat your way through the day with the glut of food samples, I spent time meeting exhibitors and making connections. And making sure that my new projects were working. The two new booths my company, Communication One Exhibits had this year were from Bob’s Red Mill and gDiapers. The Bob’s Red Mill was a custom 30’ x 30’ booth, designed by Greg Garrett Designs of Vancouver and fabricated by Classic Exhibits. It was a stunner and was definitely well-received by the company – including Bob Moore, who called it ‘impressive’ – and show visitors. 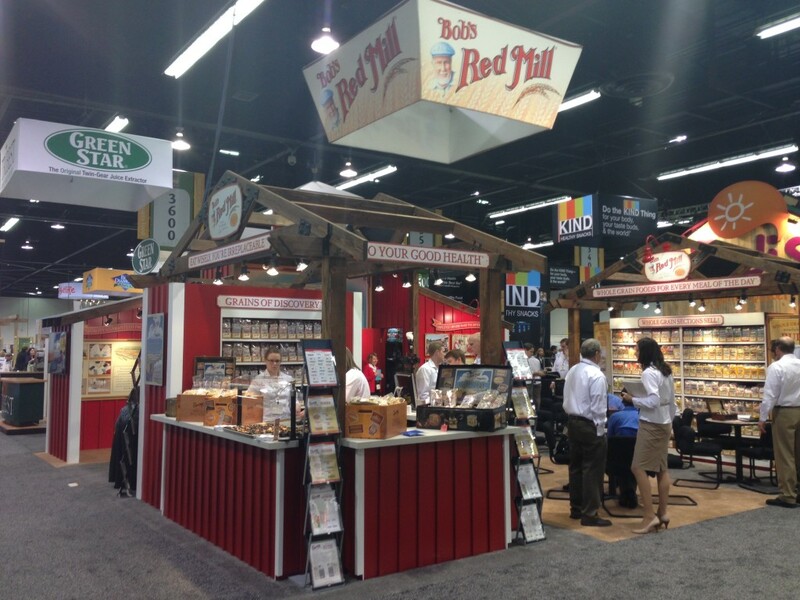 The exhibit had three structures – a main company info-display area, a product display area and – in a new move for Bob’s Red Mill – a food sampling station. The main structure was capped with a 4’ cupola high atop a structure that echoed their mill store in Milwaukie, Oregon. Either end of the main structure had 52” video screens that continuously showed informative videos. The other booth was at the other end of the scale. gDiapers, of Portland, Oregon, is a company that offers reusable diaper covers with disposable inserts. 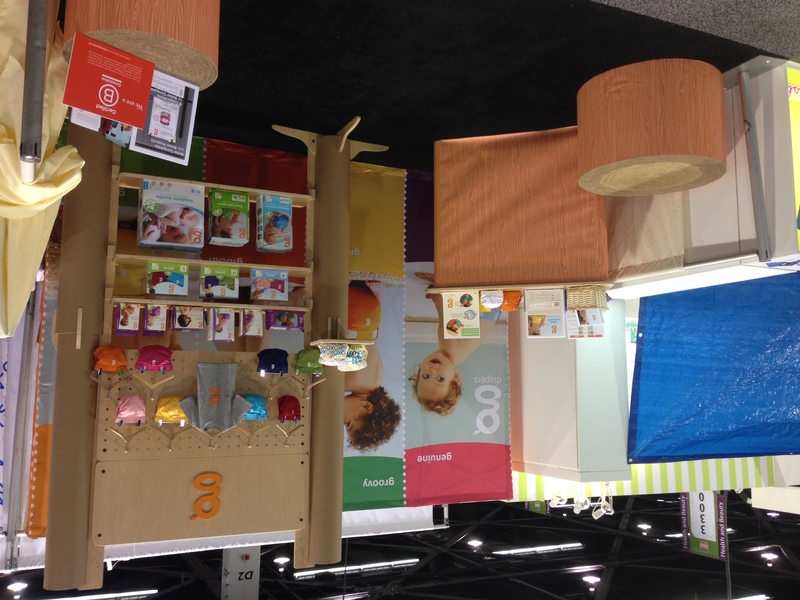 Years ago, when I was VP of Sales and Marketing for Interpretive Exhibits, we designed and constructed a 20’ in-line booth for gDiapers that had plenty of display space, slat wall and a fabric banner across the top. As their clientele needs evolved, so did the company’s desire for a simpler display that was easier to set up. So with the help of Portland’s Boothster, we designed and built a 10’ inline booth that had a small display area and a large 10’ fabric back wall, along with cardboard chairs and cardboard tube-constructed counter with wrap-around graphic. 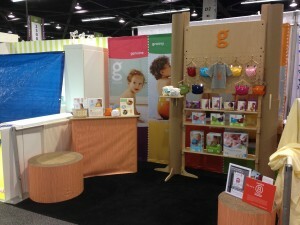 The booth looked great and gDiapers loved it! Yes, I blog about social media and tradeshow and event marketing, but my company Communication One Exhibits has a ton of great capabilities to design and fabricate tradeshow booths to suit any need. Let me now step off of my soapbox…thank you verry much for your time! I’ve had the pleasure of representing Classic Exhibits, based in Portland, Oregon, for several years. They produce great products and work diligently with customers and end users to give excellent value. 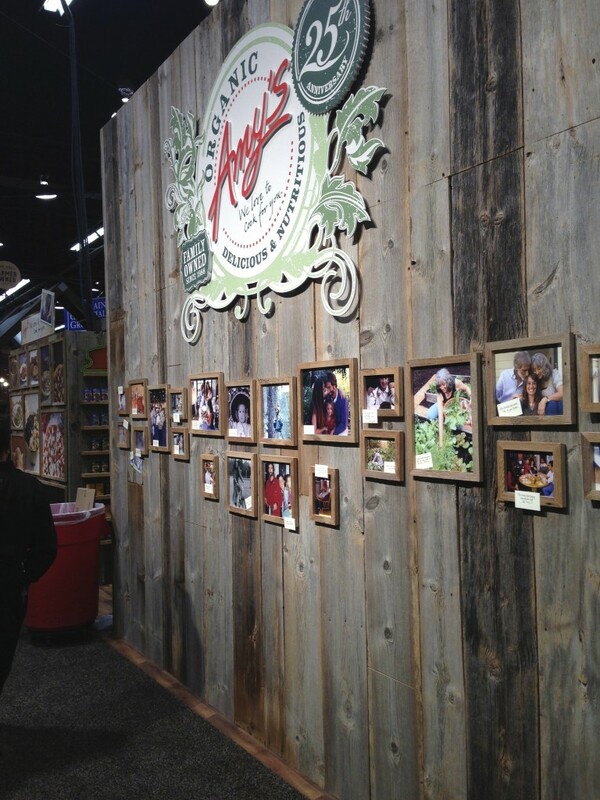 They’ve exhibited at Exhibitor in Las Vegas for years, showing off great new exhibits that lead the industry. This year could be different. When I got wind of their exhibit this year, I just had to investigate. After all, that’s what I do. 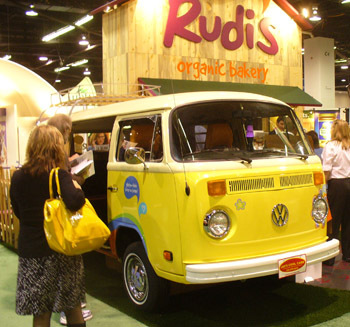 The tradeshow exhibit is at least 6 – 8 months away – have you considered your tradeshow marketing strategy? You’d better get started – that’s not that much time! No, I didn’t say RUSH things…I mean you have better get your stuff together because those six months are going to go by pretty quickly. And the last 2 months will go by like an Indy Racer if you haven’t spent the first four months working on it. 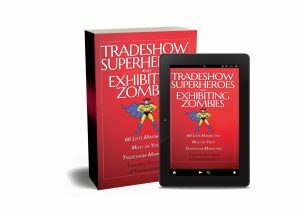 Face it: when people visit your tradeshow booth, they expect to see the BEST that your company has to offer. If you’re a manufacturer, your prep time may mean several meetings and coordination with your manufacturing division to make sure you’re showing off the BEST of your BEST. 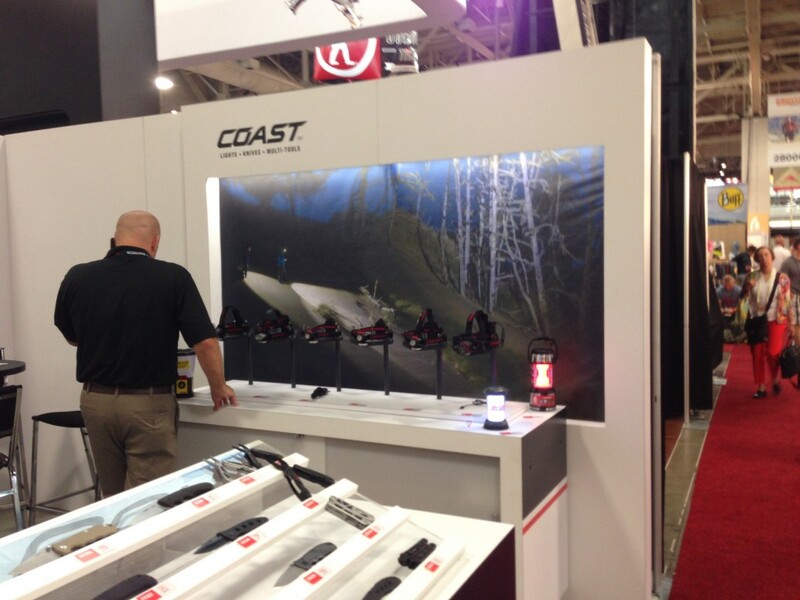 Why would you want to go to a tradeshow and put anything but the BEST of the BEST you have to offer on display? This is the one time a year that those visitors get a chance to see your goods and services. They’re comparing YOUR BEST with the BEST of several other companies – perhaps dozens of other companies. So plan to put on your best. This means your best graphics. Your best exhibit. Your best product. Your best people. Your best lead-capturing system. 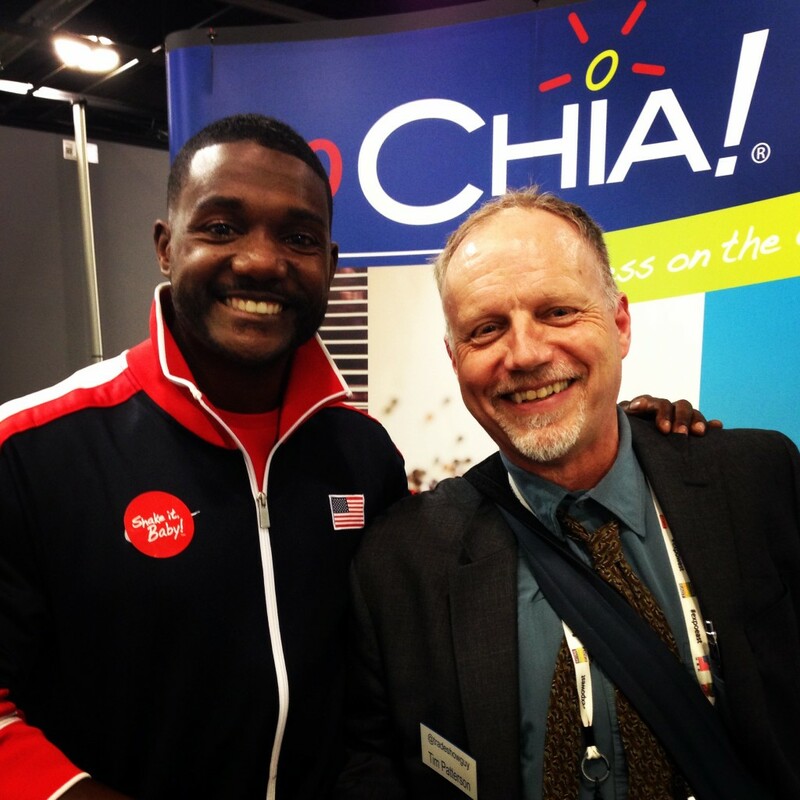 When you put your best out there, you’re competing on the same level as the rest of the exhibitors – your competitors. Face it, most of them (but not all) are putting on THEIR best face at the exhibit. So you’d better be putting on YOUR best, too. The challenge, though, is that we’re all just humans. We all have crazy schedules and incessant demands. And given those demands, when push comes to shove putting on your BEST is often extremely difficult to do. That’s why it takes more effort than you really think it will. So that gets you back to idea of starting NOW and not waiting another few months on your tradeshow marketing strategy. If you start now and determine WHAT you’ll need to do to put on your best, HOW you’re going to do it, and WHO is going to help you to make sure it’s going to get done, the odds increase that you’ll actually make it happen by the time the show rolls around. And that gets back to the idea of loving care: if you approach the planning of your next tradeshow with loving care, you’ll cover all the bases you need to cover to ensure that you are putting on your best. Start now. 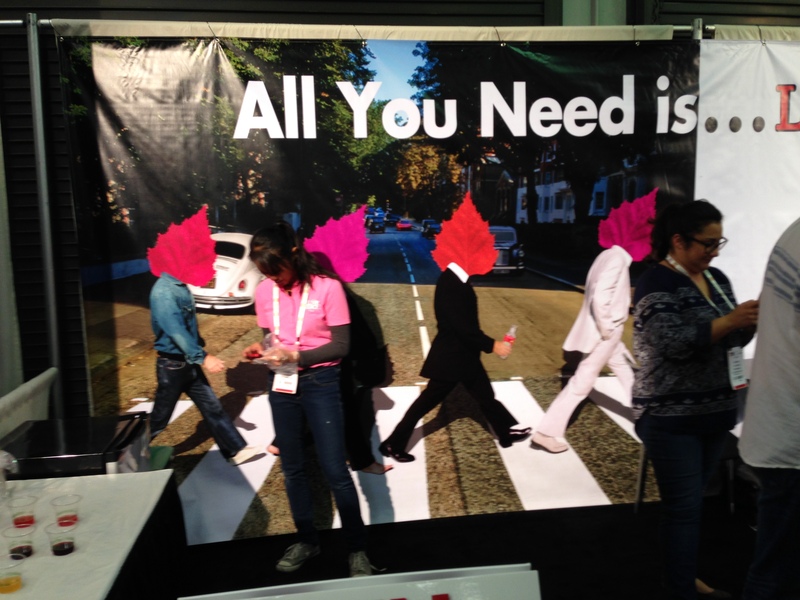 Give your tradeshow marketing strategy some good old-fashioned love. 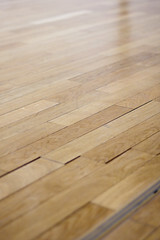 Trade show booth flooring is often overlooked as an important trade show accessory. Yet, your exhibit area floor covering can play a vital role in furthering your company brand image, enhancing the overall booth design, and creating a welcoming environment that draws prospects into your booth. Consider that you have invested a tremendous amount of time and money producing a beautiful, high-impact display. This includes carefully selecting your display layout and graphics, lighting, accessories, and promotional item to help ensure you maximize your effectiveness and achieve your objectives from show participation. Rather than work with the concrete or other plain utilitarian flooring most exhibit halls feature, it will serve you well to go the extra step to design and order custom flooring that complements your exhibit. Your flooring contributes to making an impression that reflects the quality of your product, as well as plays a role in attracting visitors who want to learn more about your products. For example, custom carpet with your logo sends a strong message of professionalism and character. Beautiful area rugs create a warm, inviting atmosphere that emanates comfort and service. Bold colored carpets depict strength and cool colors like blue and gray create a professional and crisp environment. Your flooring also can be crafted with color changes and lines to help the traffic pattern in your booth. Another consideration with your flooring is the padding beneath your carpets. A good pad adds comfort and makes it less tiring to be on your feet for hours at a time. While attendees may not notice, those working the exhibit will feel the difference and see the difference in the number of leads that are generated from your efforts. Bored at the tradeshow? Here’s a list of things to do that will lively up your experience! 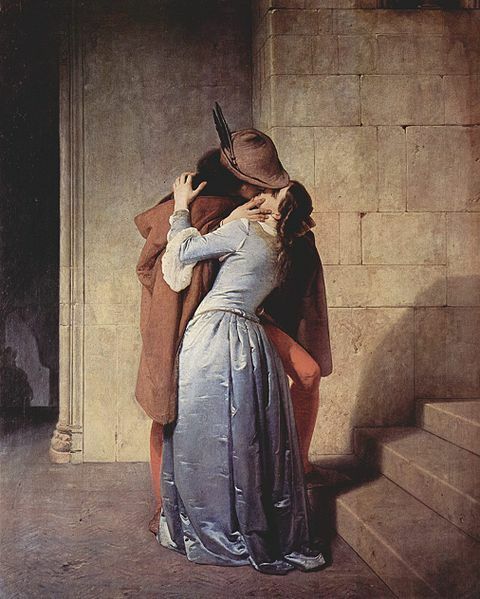 Whether you’re an exhibit or an attendee and you’ve been doing it for a long time, you might ask yourself: Am I Getting JADED? Next time you’re at a tradeshow, take this list with you. Maybe by doing a few of these things it’ll help break you out of a rut (okay…some of these will take a little more preparation and execution before the show…but use ’em as inspirational thought-starters if nothing else). Before leaving your office spend some time on Twitter compiling a list of people at the show that are Tweeters. Make a list of who they are and what booth they’re at. Stop by the booth and tell them you found ‘em on Twitter. Draw attention to yourself and your company. If appropriate, wear a goofy hat, a pair of Mickey Mouse ears, Homer Simpson slippers. Anything unusual is a conversation starter. Pick up literature from as many booths as possible. Read it that night in your hotel. Make notes about questions you’d like to ask. Go back to the booth and ask. Take a Flip video camera and ask visitors to explain why they stopped by your booth. Or take it around the floor on your break and get a few comments from other exhibitors about the show and what their experience is at the show. Take a camera. Take lots of photos. If you see a cool booth, ask permission for a photo first. If you connect with someone via Facebook or Twitter, be sure to take their photo and post it online. Bring chocolates and instead of putting them in a bowl at your booth, hand them out as you go from booth to booth to other exhibitors. Tape your business card onto the chocolates. Buy a half-dozen thumb drives and put your company information – brochures, current press releases, catalogs, website, etc. – on it and have it ready to hand out to a few well-qualified media contacts or potential clients. Sit down with a professional radio person (! ), have them interview you about your company. Create an audio CD with a nice label and title such as “All You Ever Wanted to Know About XYZ Company” or “The Inner Secrets of the XYZ Company Widget” and make a couple of dozen copies. Put a label on them that says “limited edition” and make sure that you qualify anyone you give them to. If you typically don’t go to seminars, pick at least two and go to them. If you typically attend seminars, find one with an unusual title that you might not attend and go to it. Make a note immediately on any business card you collect from a person (not a card you just picked up from a table). Write down a pertinent part of the conversation, a future follow-up or an item that will make you remember them. By the time you get back to your hotel, you’ll have forgotten what they even look like. Are you typically a bit shy? Break that habit. Talk to people in buffet lines, restaurants, elevators. Come up with a few questions you can ask to break the ice. Have fun: these people don’t know you’re shy! If you typically spend the day working the booth and greeting visitors, arrange your schedule so you get at least an hour or two to walk the show floor and schmooze with other exhibitors, especially those that might be potential partners and those that you would consider competitors. Talk to a show organizer and ask her how this show compares to previous years…or find some other topic of conversation. Bring three times as many business cards as you think you might need. Go to the city’s visitor center and see what kinds of fun things you can do in your off-hours. 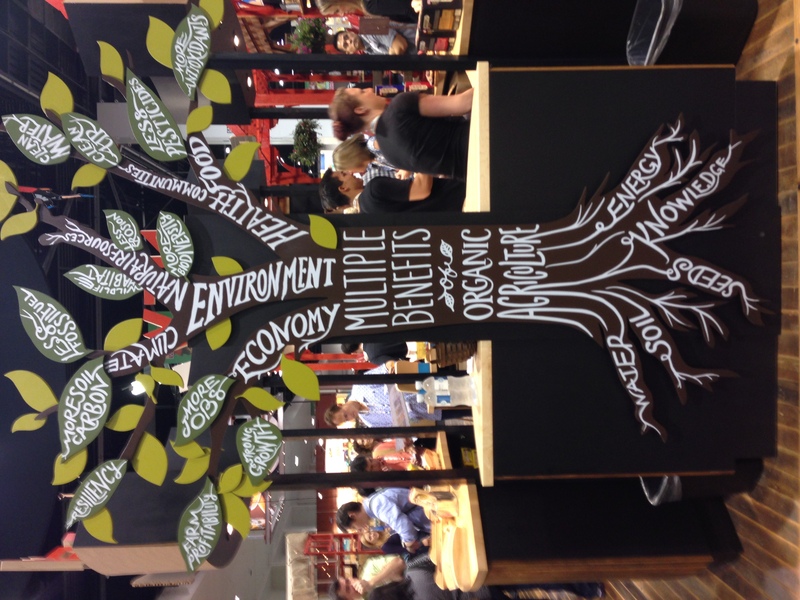 See how many booths you can walk by before a booth staffer invites you in. Look up old friends in the event city using Facebook or Twitter and connect with them. Smile at everyone. Even if they aren’t smiling at you. Take notes about how much food costs. Hot dog and coke – $14!? Compare notes with fellow staffers. Boo and hiss the high prices. Ask other exhibitors what they paid for drayage and shipping. Compare notes. See if you can set up your booth before your neighbor. Go a whole day without eating restaurant food by taking food snacks such as energy bars, fruit, trail mix, etc. Bring a small white board. Write a Haiku poem about your company or product on it. Invite your visitors to add their Haiku. Practice Extreme Customer Service. As if you were a Disney employee. If the speaker at your seminar or breakout session is boring, create a game where you write down every word he says that begins with the letter M. Or T. Or draw a cartoon of the speaker. Post it on Twitter. Ask other visitors what they do for fun. Take notes and incorporate their ideas into yours. What ideas do you have to break those long days into more fun? Share!